As children, we often conjured up monsters in the darkness of the night. These monsters were so real to us that we were unable to go to sleep, we called for our parents to rescue us and we even shook in our sheets. What we now know as adults is that there were no monsters. Even though they seemed so very real to us as kids, we recognize that the monsters were simply a reflection of our own vivid imaginations. As adults, we still create our own monsters. These monsters come to us in the form of fear, worry, lack and anxiety. These feelings are created only in our minds. Like monsters, they are only as real as we think they are. Perhaps we can take a lesson from our childhood and recognize that we are creating our own monsters with our imaginations and thoughts. Perhaps we can “turn the light on” and the monsters will go away. The light is the knowledge that you are safe, secure, and there is enough. The light is the knowing that you are not alone. The light is the love that is in your heart. Where there are no shadows, there are no monsters. 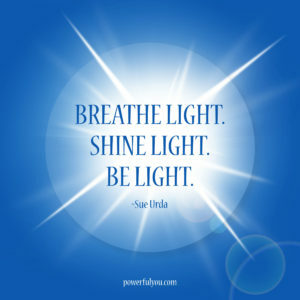 Keep shining your light.